I had a cheesier title for today's post that went something like "Awabi Awe-baby", but it was 1. too cheesy and 2. didn't really rhyme. I'm trying to get back into the swing of things, but I am still finding it hard to get organized. Work is still in a flux, I am just starting back up on my runs, my house continues to be a mess from my aunt and uncle's visit (it isn't that they made a mess, but that I spent so much time with them, I didn't have time to do my routine cleaning), and to add to all this, I am still dealing with the aftermath of my Citibank fiasco, in which they gave away my bank account number to some lady in FL or they had given me her account number (15 yrs ago!) - whatever it was, I had someone writing checks with her name and my account number that Citibank was processing and deducting from my bank account (which, of course, does not have her name on it). They subsequently proved to be so unapologetic and horribly difficult to work with in trying to resolve this issue that I decided to end my +15 yr relationship with them. Did I write about this already? I can't even remember - that's how much I have been running around like a chicken without its head. In spite of all this insanity, I managed to have one of the best sushi meals in recent times over at Sushi Yoshi last night. I swear, Yoshi-san keeps surprising me just when I think I know all about him! He always makes it a point to go the extra mile by opening up a new fish for me and on presentation when I am there, meticulously arranging pieces of fish on his best plates. What can I say?! I'm his favorite Sushi Princess! The cleaning job of the night was on Kin-me-dai (Gold Eye Snapper). This is a fish we ate frequently in my hometown of Nagoya, Japan, but I had never had it fresh. It was always stewed in a sweet, soy sauce-based broth. My grandma was a pro at this dish, giving it a signature ginger-kick. This kin-me-dai from last night was a giant compared to those I had in Japan - this New Zealand-born guy was probably a good 2 feet long compared to the 3/4 footers from Japan! 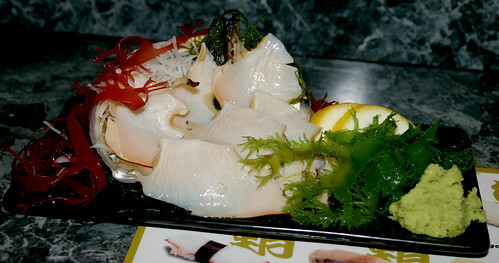 Surprisingly, the kin-me-dai was nothing like regular tai (snapper) in texture, more closely resembling the somewhat sticky bite of fresh scallops. The flesh clung to your tongue as it released its clean, faint sweetness, which was highly accented by the wasabi and soy sauce accompaniment. I also had an absolutely delightful plate of awabi (abalone). I love awabi. I mean, I really love it. I love everything about it from its firm, chewy flesh to its delicate briny scent, accented by the sweetness of the flesh. There is no other seafood in which the faint sweetness of the flesh harmonizes so well with the scent of the ocean. The firm texture is just icing on the cake that promotes a stronger bite to help release every ounce of gastronomic delight from the flesh. Opaque and translucent, awabi flesh is so inviting and so enticing. Here, have a closer look! So, you might be asking - how do you get to those secret treasures a sushi restaurant has hidden away? Communication. It's the only way. There is no sushi chef who can read your mind or guess your preferences correctly without conversation. I always tell sushi chefs what I like when I sit down for the first time at their counter - not just which fish I like, but what I like about the fish, what flavors I enjoy, what tastes tickle my fancy, etc, etc. As the meal progresses, I compliment what I enjoyed about the fish and not just whether it was good (or not). After several visits, the chef will have a good sense of what you're all about and voila - Open Sesame to the Best, the Freshest, and the most Delicious will be yours to be had! That looks absolutely delicious. Now Im hungry again. Thanks for commenting - I think it's your first time! Welcome~! And yes, this awabi was nothing short of delicious! There are perks to ride on a Princess' coattail. The awabi was such a treat, much better than any of my previous experiences. I never really liked it, until Yoshi-san plated one that was still alive a few moments earlier. Yes, that taira-gai was definitely blog-worthy, but alas, no pictures. Maybe next time! Sure, do you live in SF or the South Bay? Alice, south bay. more specifically, mountain view.